For the last version of the EDDI Compiler, it has been necessary to extend the dynamic memory allocator, to support free memory. In this post, we will see how to write a simple Memory Manager in Intel Assembly for Linux. In the past, we've seen how to write a basic memory allocator, this time, we will write a more complete version. The implementation is made in 64bits Intel Assembly. Each time some memory is asked, the blocks are tested one by one until an available one is found. If no available block is found, a new block is allocated after the last one and this block is returned. The parameter is passed in the r14 register. The return value is returned in the rax register. We just have to call sys_brk in order to get the location of program break. Then, the start and the last addresses are the same. The address to free is passed in the r14 register. We have to go back 16 bytes (size of the control block) to go to the start of the block. The availability flag is set to 1 (the block is free). The necessary number of bytes is passed in the r14 register. We add 16 bytes (size of the control group) to the size as we also need some place for the header. Then, we load the start and last addresses. If both addresses are equal, we need to allocate more memory (detailed later). Then, we check the size and the availability of the current block. If the size is enough to fit the needs and the block is available, we set it to unavailable. We return the address past the control block (16 bytes). To move to the next block, we just have to add the size of the current block to the current block address. To allocate memory, we compute the new program break and call sys_brk again to set the new program break. The block is then set to not available and the size is set. We return the address past the control block (16 bytes). The rest of the program is just here to save and restore the registers and compute the stack frames. The overhead for small blocks is important. For example, allocating an 8 bytes integer needs a 24 bytes block, thrice the size of the int. In the future I will try to make a more powerful version of this memory manager. As I'm in holiday, the work is going pretty fast. The version 1.1.1 of the EDDI Compiler (eddic) is available. The constructor is called once the memory is allocated. The delete operator calls the destructor and then free the memory. When a structure is allocated on the stack, the constructor is called at the declaration point and the destructor is called when the variable gets out of scope. The memory manager is quite simple for now. Memory is allocated in blocks. Each block has a header indicating the size of the block and its availability. The size of the header is 8 bytes in 32 bits and 16 bytes in 64 bits. The free operation can be done in constant time by just setting the availability flag to false. The disadvantage of this technique is that all the blocks needs to be tested to find a free block. This can be slow in some situations. I will try to make a better version in the future. For that, the memory model has been improved. All the offsets are now increasing and the stack addresses are set at the end of the block. The peephole optimizer has been improved to use conditional move when possible. Moreover, the peephole optimizer is now able to perform some local copy propagation. The next version of the EDDI Compiler will be the version 1.1.2. This version will add features to read the command-line. Moreover, it will also add support for char type and string comparisons. With that, I think that the language will start to be usable for toy applications. There will be some improvements to the code that have been left aside for a too long time. The exact version I refer to is the v1.1.1 available in the GitHub tags or directly as the release branch. In the previous parts of this serie, we saw some C++11 Synchronization techniques: locks, lock guards and atomic references. The tests have been made with 1, 2, 4, 8, 16, 32, 64 and 128 threads. Each test is repeated 5 times. As expected, the mutex versions are much slower than the atomic one. An interesting point is that the the atomic version has not a very good scalability. I would have expected that the impact of adding one thread would not be that high. I'm also surprised that the lock guard version has a non-negligible overhead when there are few threads. In conclusion, do not locks when all you need is modifying integral types. For that, std::atomic is much faster. Good Lock-Free algorithms are almost always faster than the algorithms with lock. In command-line program, we often faces problems with the management of command-line options. When you have a few options, it's not a problem. But when writing complex programs with tens of options (or hundreds), it starts to be too complicated to manage by hand. That's where Boost Program Options enters the game! 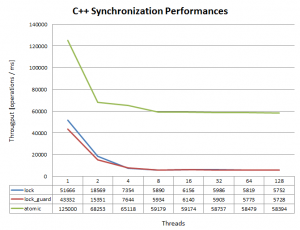 Boost Program Options is one of the Boost C++ Libraries. It is a very powerful library to handle command-line options. You define all the options of the program and then Boost Program Options takes care of all. It parses the command line, handles errors, gets values and even displays help. It is not a perfect library. But it is very complete that will answer most of the common needs. This library is not header-only. You will need to build the library and link your program with the library. The parameter to the constructor is the title of the options. To add options, you use the add_options() function and append all your options, each one surrounded with parenthesis. Here, we declared two options (help and version). They can be set with --help and --version. You can use operator on the description to output all the options of program. With that, you can display with either --help or -h. Even if you select help with -h, you can still verify if help has been set with count("help"). For the story, the option value are stored as boost::any. You can get the value of the option by using operator on the po::variables_map. You can get the value type with the as function with the type you need. On the command line, the value can be set with --compression 10, -c 10 or -c10. With that, if the option is not set on the command line, the option has the specified value. With that, the option is always defined. In this article, we saw the most important aspects of Boost Program Options. With these notions, you can start using this great library. If you need more information about the library, you can read the official documentation that is very well made. We already saw that this class was not safe at all to use in multithreaded environment. We also saw how to make if safe using mutexes. This time, we will see how to make it safe using atomic types. The main advantage of this technique is its performance. Indeed, in most cases, the std::atomic operations are implemented with lock-free operations that are much faster than locks. The C++11 Concurrency Library introduces Atomic Types as a template class: std::atomic. You can use any Type you want with that template and the operations on that variable will be atomic and so thread-safe. It has to be taken into account that it is up to the library implementation to choose which syncronization mechanism is used to make the operations on that type atomic. On standard platforms for integral types like int, long, float, ... it will be some lock-free technique. If you want to make a big type (let's saw 2MB storage), you can use std::atomic as well, but mutexes will be used. In this case, there will be no performance advantage. The main functions that std::atomic provide are the store and load functions that atomically set and get the contents of the std::atomic. Another interesting function is exchange, that sets the atomic to a new value and returns the value held previously. Finally, there are also two functions compare_exchange_weak and compare_exchance_strong that performs atomic exchange only if the value is equal to the provided expected value. These two last functions can be used to implement lock-free algorithms. std::atomic is specialized for all integral types to provide member functions specific to integral (like operators ++, --, fetch_add, fetch_sub, ...). If you test this counter, you will see that the value is always the expected one. In this article we saw a very elegant technique to perform atomic operations on any type. I advice you to use std::atomic any time you need to make atomic operations on a type, especially integral types. In the next post of this series, we will see how to use the Futures facility to perform asynchronous task. The version 1.0.3 of the EDDI Compiler (eddic) is available. The only improvement to the language is that the size of a global array can now be defined using a constant global variable. The main improvement of this version is the addition of inlining in the optimization engine. This optimization replace a call to a function by the body of the function. For now, the inlining optimizer is quite basic. For now, it doesn't inline only a specific call site but all the call sites of a given function. Moreover, the heuristics used for inlining are quite simple (only the size of the function is taken into account). Only functions that takes int and float parameters can be inlined. This optimization will be improved in the future. The second main change is the arrival of a basic register allocation. In each function, one or more variables can be assigned to registers. Only the most used variables are allocated into registers. Another optimization is that variables that are not used after all optimization techniques have been applied are removed from the function storage. The unused functions are also removed from the program after the optimization passes. Moreover, the performances of optimization engine have been improved by about 20%. The MTAC representation has been improved. The ARRAY operators have been removed because they can be replaced with the DOT operators. The preamble and prologue generations for LTAC has also been refactored. When it is possible, the stack frames are not generated. Finally, the configuration of the compiler has been improved with several new optimization option and the options being separated into several option groups. The next version of the EDDI Compiler will be the version 1.1.0. The main change will be member functions inside of structures. For now, there will be no kind of virtual functions and inheritance but that will certainly come in its time. The exact version I refer to is the v1.0.3 available in the GitHub tags or directly as the release branch. The version 1.0.2 of the EDDI Compiler (eddic) is available. The language itself does not features something new, but the support of pointers has been greatly improved. You can now declare arrays of pointers and return pointers from functions. Structures can hold pointers as well. Moreover, arrays of structures are now supported. These new features have increased the number of operators of the MTAC Level. The more important part of this new version resides in the Optimization Engine. A new optimization technique has been implemented: Dead-Code Elimination. This technique removes all code that calculates values for variables that are not used anymore after this statement. Another change is that empty functions are removed after optimization (as well as every call to the removed functions). The liveness analyzer has been replaced by a global Live-Variable Analysis routine. This information is used in the optimization engine and in the LTAC Compiler. Finally, the Peephole Optimizer has been improved to support some local optimization techniques like constant propagation and basic dead-code elimination. The code generators have also been improved by outputting only native functions that are called. It means that if the program does not print a float, the _F5printF function will not be generated. Moreover, the native functions have been moved in external assembly files. The next version of the EDDI Compiler will be the version 1.0.3. This version will see a first basic version of Inlining optimization and certainly register-allocation of the most used variables. There will certainly be no change of the language itself. A cleanup of the two compilers (MTAC and LTAC) will be performed as well as simplification of the MTAC Language if possible. The other changes will mainly be minor changes to the compiler. The exact version I refer to is the v1.0.2 available in the GitHub tags or directly as the release branch. The version 1.0.1 of the EDDI Compiler (eddic) is now available. This sample is not very useful, but it shows the usage of pointers well enough. Another improvement to the language is that it supports now nested struct. It means that a member of a struct can be a struct itself. That's it for the language improvements. On the side of the compiler itself, I've improved the error reporting for structs. For example, the compiler display a clear error when a struct is recursively nested. The peephole optimizer has been improved a bit with new optimization, but it still rather simple. The optimization engine is now able to optimize functions in parallel. The improvement is not quite large, but that can be useful if there are a lot of functions. I've also improved a lot the Abstract Syntax Tree representation of assignments to unify variable, array and struct assignments in one Node with the notion of LeftValue. Finally, the tests have also been improved. New tests have been added and helped me find new bugs. Moreover, the tests are now made on each optimization levels for each test case. There was some issue with smallest optimization level. 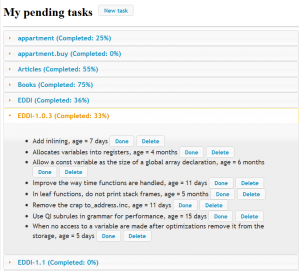 The next version of the EDDI Compiler will be the version 1.0.2. This version will adds support for returning a pointer from a function. Moreover, it will also adds support for pointers inside of struct. The last change to the language will be that you will be able to declare array of pointers and array of structure. The peephole optimizer will perform more powerful optimization. At least, I will add an optimization to remove assignments to registers that are not used and use less registers. That will perhaps imply to add support for basic blocks in the LTAC Language. I will also add a powerful dead-code optimization to the Optimization Engine. This will replace the RemoveAssign and RemoveMultipleAssign pass of the engine, being more powerful. The exact version I refer to is the v1.0.1 available in the GitHub tags or directly as the release branch.